As I have done for almost every Legendary event in the past two years, I will once again be live blogging my experiences from the new Star Forge Showdown which takes place this weekend. 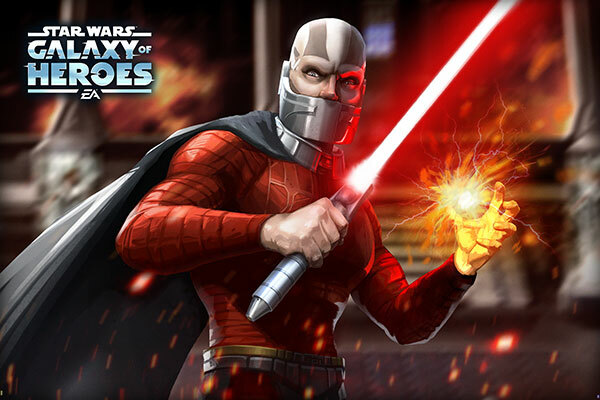 Starting tomorrow, April 12th, and running through Sunday the 14th only, this event is being called the toughest event in the history of Star Wars Galaxy of Heroes. “This will be an extremely difficult battle and for the first time in an event, you’ll need each of your characters to be at least at 17,500 Power to enter” is what we have been told, and I am under the assumption that even those who have all characters at 17,500 power (basically Gear 12 with strong mods) will not be guaranteed to unlock Darth Malak. Below I will detail my roster of characters needed and then, once the event is live and my schedule allows, I will chronicle my experience fighting the event. As it appears now I should have a window of time from 5-6 am and then again from 7:30-10 am ET on Friday, April 12th, to play the event, so I will work hard to detail what I see and how I attack the two different battles. All of this will, of course, take place on my personal account and I thank you in advance for your interest. I should be able to start fighting around 5 am then I will continue around 7:30 am ET on Friday morning. 04.12.19 @ 5:06 am ET – JKR, Bastila, Jolee, Mission and Zaalbar start us of on the Light Side. Note T3-M4 is not being used here. We are in a room with multiple characters in stasis, four of which are playable/can be attacked. Darth Malak is in the middle with two Assault Droid Mk IV with a Star Force Security blue locked buff. The graphics are awesome. Upon seeing the four stasis characters and reading that Malak gains major buffs if they are “absorbed” by him, I killed off one of the stasis characters right away. Next, I landed armor shred on Malak then Daze on both droids. Now I focus on another stasis character, and just after knocking it off, Malak absorbs the buff of a third. Now with several locked buffs over his head, I have one stasis character, two droids and a buffed Darth Malak in front of me. Focusing on the final stasis character I am able to take them out with my entire team intact against Malak and the two droids, which will now get my attention. A Revan/Bastila dual attack takes out one droid, but when I kill the other they both come back… Grrr. Focusing now on Malak, he quickly kills Zaalbar with his Force Drain style ability, so I decide to adjust and take out one droid, but not the other. Now back to focusing on Malak. As I try again I am finding that my strategy is not ideal, maybe due to too many adjustments mid-stream. I will have to re-read the stasis characters’ buffs before I try again as Malak’s increased strength begins to show as he takes me out one by one. I will be back around 7:30 to try again. 04.12.19 @ 7:32 am ET – Ok, back again for attempt #2. I have some ideas on strategy that I want to test out and got a few tips from my guild as well. Here we go! This time around I went for the stasis character on the far left and took him down first. The goal this time around was to hit Malak as little as possible, weaken Lord Businesses’ captured Master Builders, I mean the stasis characters, and land as many Armor Shred debuffs on Darth Malak as possible. After taking out the guy on the far left I weakened each of the others and had just one stack of Armor Shred on Malak when he absorbed one stasis character. After that I took the other two out and was able to get Mission Vao to debuff the droids several times throughout the fight. Sensing my progress after the 2nd Armor Shred I decided to go in for the kill and take Darth Malak out. The Armor Shred, IMO was the key, and I used the exact same lineup as above with no gear or mod changes. 04.13.19 @ 11:30 pm ET – Consulting with one of our Senior Writers, Kaitco, and her experience with this event is growing more and more frustrating. With all but Mission at Gear 12, very high speeds and fantastic mods, she is struggling despite using the strategy/approach above and reviewing others posts. This really feels to me like a Gear 12 requirement, despite the 17,500 power notation, and of course the more g12 pieces the better. 04.12.19 @ 7:50 am ET – Time for the Dark Side of this battle. I need to get this done fast as we have a Territory War upcoming and I want to get Darth Malak added and geared ASAP for make things more difficult on our opponents. Again, like the Light Side battle, you only need 5 character to battle so if you have a 6th that is not powerful enough it is okay, provided you can beat it with the 5 you have. I am sitting Carth Onasi out of this one to start. His Zeta is on his leadership and we cannot change leaders, so Darth Revan must be in that slot. This allows Juhani to (hopefully) take a lot of hits and hopefully keep my other (stronger) characters clean(er). I started off hitting the stasis character on the far left and took him down as fast as possible, trying to avoid AoE attacks and really any attacks on Darth Malak. Honestly, I got sloppy in the end and while I was able to get him into the yellow and red health, I was not successful this time around. I weekend the stasis characters but he absorbed two of them which did me in. One thing I did do well is keep the droids under control by debuffing them as much as possible. Going to try the same thing and clean it up a bit and I will report back. Ok, some improved gear and much-improved strategy and here is how the successful attempt went down. The key in the Dark Side battle is to kill the droids, then work on killing the Jedi in the stasis chambers. You get 3 stacks of undispellable (not sure if that is a word) Ferocity on Darth Revan for each droid you kill. Once you get to the 30-40 range you’re going to see Darth Revan start hitting like a truck due to the added offense, so kill off some droids, work on a few stasis character, more droids, then the Jedi in the stasis chambers are far easier to take down. Then, get a few more stacks and go after Darth Malak. That is how my final attempt worked out and I am in the process of gearing Darth Malak now. Be the first to comment on "SWGoH: Star Forge Showdown Live Blog"